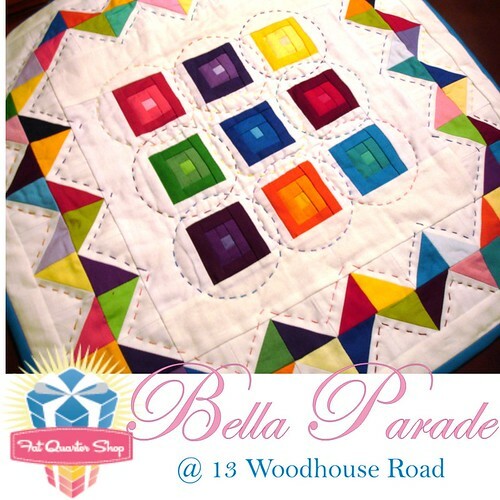 A few weeks ago I was lucky enough to be asked by Shruti of 13 Woodhouse Road to help her out with a fun month long project on her blog, the Fat Quarter Shop Bella Parade. Every day is represented by a different Bella solid fabric. She posts photos of quilts and other inspiration based on that color. Readers are invited to join in the fun and post photos in the Flickr group that correspond to the day's color. There are all sorts of prizes! Each week there is a fellow blogger that picks 3 solids and 3 prints that coordinate with the color of the day. Well, this week that blogger is me! Today the color of the day is Dill. I hope you continue to check back this week and see what else I've come up with but also, don't forget to go over the Shruti's blog to get started winning some prizes! FQS Bella Parade - Lime!